The Holland America Line ordered Nieuw Amsterdam to provide a running mate for their 29,511-ton Statendam that entered service in 1929. She set out on her maiden voyage from Rotterdam - Boulogne, Southampton and New York May 10th 1938. 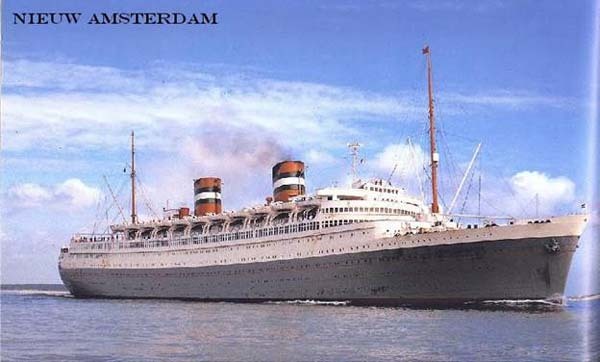 Following the outbreak of World War Two in September 1939, the Holland America Line operated Nieuw Amsterdam on cruises out of New York until the Dutch surrendered to Germany May 14th 1940. Nieuw Amsterdam was then laid up at New York until the British acquired her in September 1940. After being converted to a troopship at Halifax/Canada, her first wartime deployments were to transport Australian and New Zealand troops to the battlegrounds in the Middle East. The Japanese Attacks on Pearl Harbor December 7th 1941 led to Nieuw Amsterdam being transferred to the Pacific to serve as a troopship in the war against Japan. By 1944, troops from around the world were gathering in Britain to prepare for the invasion of Europe. Nieuw Amsterdam was returned to the Atlantic at that time and completed ten trips across the North Atlantic transporting Canadian and American troops to Gourock/Scotland. Following the completion of her repatriation duties in April 1946, she had to undergo an 18-month refit to be converted back to a passenger ship. The following 25 years saw Nieuw Amsterdam operated between the Rotterdam - New York run and cruising. By 1971, Trans Atlantic travel by ship had declined to an extent the Holland America Line was forced to base Nieuw Amsterdam at Port Everglades to serve as a full time cruise ship. She had to be withdrawn from that service in 1973 as her superstructure began showing signs of heavy corrosion. Nieuw Amsterdam set out on her final voyage January 9th 1974 from Port Everglades to the ship breakers at Kaoshiung/Japan via the Panama Canal. She arrived at Kaoshiung February 25th and within 8 months had been completely dismantled.